The 46.5m high-performance motor yacht Project 12 is now for sale with Cecil Wright & Partners and Burgess. Built by Cantieri di Pisa in 2013 to ABS class and MCA compliant, this latest yacht in the Akhir range offers exhilarating performance from twin 4,670hp MTU engines. The full-beam sky-lounge on the upper deck is an exceptional feature with large sliding doors and bulwarks that fold down to create a balcony on each side with spectacular 180° views. The main saloon provides a versatile living space with comfortable seating areas, a bar and separate music or library area. Other notable features include a floating glass staircase leading up from the main deck, with a large skylight overhead illuminating the natural and modern interior designed by Mark Berryman. Project 12 has an appealing and versatile accommodation layout in 6/7 cabins that will ensure she is equally popular with charter clients or private guests alike. The full beam master suite on the main deck is accessed through a large office/lobby area and features twin en suite bathrooms. A full-beam VIP cabin incorporates a separate lounge area, which can be completely shut off from the principal cabin with a soundproof sliding door thus converting this large area into two separate double cabins. Further accommodation is provided for another eight guests in two double and two twin cabins, each with additional Pullman berth. 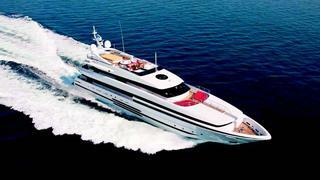 Project 12 is lying in Livorno, Italy and asking €19,500,000.